Bel Canto Senior Singers to present free concerts on May 6 and May 12. MILWAUKEE - April 29, 2014 - PRLog -- The Bel Canto Senior Singers outreach program, James D. Stout, conductor, and Elna Hickson, accompanist, will present two free concerts in May. The Bel Canto Senior Singers: San Camillo will present "Come to Blueberry Hill" on Tuesday, May 6, at 7:00 pm in the O'Donnell Room of San Camillo Senior Living Community, 10200 W. Bluemound Rd., Wauwatosa, WI. This concert will feature over a dozen songs on a fruit theme, as well as the opportunity for the audience to sing-along. The performance is free and open to the public. The Bel Canto Senior Singers: New Berlin will present "You Shall Have a Song" on Monday, May 12 at 7:00 pm at Holy Apostles Catholic Church, 16000 W. National Ave., New Berlin, WI. The program includes a variety of sacred and secular pieces, as well as an audience sing-along. The performance is also free and open to the public. "You Shall Have a Song"
The Bel Canto Senior Singers Program began in 2006 at San Camillo Senior Living Community in Wauwatosa. A second site was established at Holy Apostles Parish in New Berlin in March of 2014. 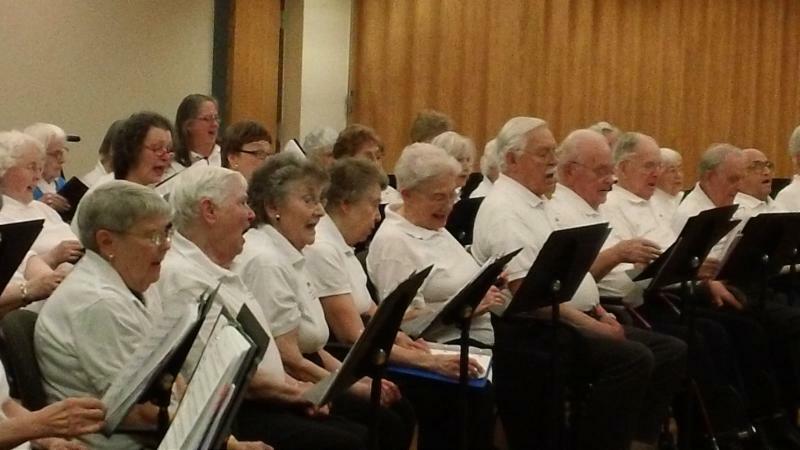 The Senior Singers Program is open to anyone in the community 55 or better who enjoys singing, regardless of previous singing or musical experience. No audition is necessary. All kinds of music are performed; hymns, Christmas carols, Broadway tunes, popular songs of the past - almost anything. There is increasing scientific research that being a member of a chorus has positive physical, mental, emotional, and social benefits for all age groups. Specific research shows that senior citizens who belong to a chorus experience less depression, less falls, less visits to the doctor, and less need for medication than the general population. Older adults who sing also report a lift in their moods, increased energy, and increased social interactions. The program is run by professional conductors, accompanists, and administrators from the Bel Canto Chorus organization. A typical rehearsal begins with gentle stretching and vocal warm-ups. The bulk of rehearsal is spent learning the music, but time is also given to learning basic musical concepts and practicing good singing technique. Founded in 1931, Bel Canto Chorus enriches the lives of its audiences and members through the presentation of fine choral music. The group has been led for more than 25 years by Richard Hynson, considered one of the nation's finest choral and orchestral conductors (American Prize Winner 2012). Bel Canto Chorus ranks in the top ten percent of choral organizations in the country in terms of budget, longevity, and repertoire. Educational outreach includes Bel Canto Senior Singers and Bel Canto Boy Choirs. Characterized by a heartfelt belief in the value of Bel Canto Chorus, and supported by its 100 devoted singers, audiences, talented artistic and administrative staff, and dedicated board members, the group's passion for sharing the thrill of live choral music has remained steadfast throughout its long, proud history. For additional information, photos, or interview requests, call (414) 481-8801.